Location: Located in the Caribbean 80 km off the coast of Florida (USA). The flight time from Miami to Nassau (the capital) is only 45 minutes. Other neighbouring countries include Cuba, the Dominican Republic and Haiti. Head of State: HM Queen Elizabeth II represented by the Governor General, HE Dame Marguerite Pindling. Government and Politics: The Bahamas is one of the most politically stable countries in the world. It is a parliamentary democracy that has continued without interruption for more than 280 years. The Bahamas is a constitutional monarchy headed by Queen Elizabeth II in her role as Queen of the Bahamas. Political and legal traditions closely follow those of the United Kingdom and the Westminster system. 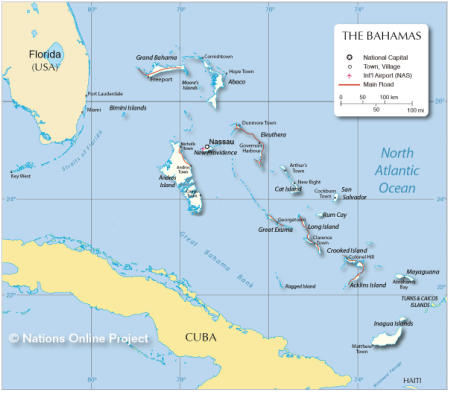 The Bahamas is a member of the Commonwealth of Nations. The current government is headed by the Rt. Hon. Dr. Hubert Minnis, who serves as Prime Minister. The Hon. Darren Henfield serves as Minister of Foreign Affairs & Immigration. Bahamas History: The original inhabitants of the Bahamas were Arawak Indians, who had migrated from South America. Christopher Columbus landed in what is today the Bahamas in 1492. The American Civil War brought prosperity to the Bahamas, which served as a transfer point for munitions and medical supplies to be run through the northern blockade of Confederate ports. Cotton from the South was the main commodity of exchange. During the Prohibition Era in the United States, from 1917 to 1933, the Bahamas again prospered because of its proximity to the mainland. This time the islands supplied liquor for American rumrunners. Bahamians gained independence from Britain on July 10, 1973. In the post WWII years, the Bahamas has become one of the world's foremost vacation resorts. Tourism now accounts for more than 50 percent of the country's gross domestic product (GDP). Financial services are an important sector of the Bahamian economy, responsible for 15 percent of GDP. The number of banks and trust companies licensed to operate within the Bahamas is close to 400. The vast majority of them are branches, subsidiaries or affiliates of major banking institutions in North and South America and Western Europe. The Bahamas is also home to many international licensed insurance companies, brokers and agents. The coat of arms of the Bahamas contains a shield with the national symbols. On top of the shield is a conch shell, which represents the various kinds of marine life found in the Bahamas. The conch shell rests on a helmet. The main symbol of the coat of arms is a ship representing the Santa María of Christopher Columbus, shown sailing beneath the sun. The shield is supported by a marlin and a flamingo, which are the national animals of the Bahamas. The flamingo is located on the land, and the marlin on the sea, indicating the geography of the islands. 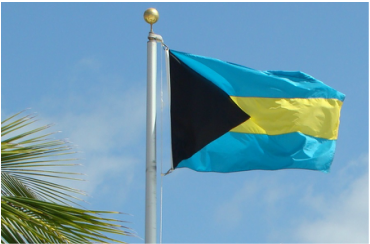 The colours of the Bahamian flag symbolise the image and aspirations of the people of the Bahamas; the design reflects aspects of the natural environment (sun, sand and sea). The symbolism of the flag is as follows: Black, a strong colour, represents the vigour and force of a united people. The triangle pointing towards the body of the flag represents the enterprise and determination of the Bahamian people to develop and possess the rich resources of sun and sea, symbolised by gold and aquamarine. The maritime flag is red, bearing a white vertical cross. The national flag appears in the first quarter. The flag is flown on vessels registered in the Bahamas. The Bahamas is a island nation steeped in the history and traditions of the sea. From 1492 when Christopher Columbus first discovered the islands, through the 17th and 18th centuries which saw the Bahamas dominated by pirates, to today’s vigorous maritime centre, the Bahamas has a rich maritime heritage. Many of the world's finest fleets and largest players in international shipping choose to register vessels in the Bahamas. The scarlet, long-legged flamingo is the national bird of the Bahamas and is found on its coat of arms. More than 50,000 flamingos inhabit the Bahamas and are protected by wardens employed by the Society for the Protection of the Flamingo and through the Bahamas National Trust, a statutory body established in 1959. The blue marlin is a majestic fish found in both the Atlantic and Pacific oceans. It is a powerful and aggressive fighter. 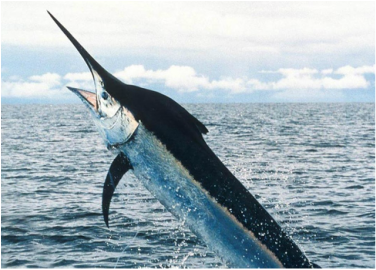 The blue marlin can run hard and long, sound or dive deep, and leap high into the air in a display of strength. The blue marlin is one of the supporters of the Bahamian coat of arms. ​March On, Bahamaland is the national anthem of the Bahamas. It was composed by Timothy Gibson and adopted in 1973. Press play to listen to the instrumental version of the national anthem.